Enter the world’s most biologically diverse habitat within a natural kaleidoscope of lush tropical vegetation and spectacular, unspoiled vistas. Monkeys, macaws and Giant Otters share their homes as you trek by trail or canoe as a true jungle explorer. Located deep in Peru’s Tambopata National Reserve, Sandoval Lake lodge overlooks sparkling, palm-rimmed Sandoval Lake, the most beautiful and wildlife-rich of all lakes in Tambopata-Madidi. This privileged location gives you exclusive access to the lake early in the morning and late afternoon, for wildlife viewing and photography. No other lodge in Tambopata-Madidi is on the banks of a protected oxbow lake. Sandoval Lake Lodge program includes two nights of fully-screened accommodation in 25 double-occupancy rooms complete with en suite facilities, hot-water showers, electricity, fans, meals, airport transfers in Puerto Maldonado, naturalist guides, lake excursions by day in search of Giant Otters, monkeys, and macaws, forest excursions, night excursions in search of caimans, and evening slide shows. The lodge specializes in small groups and individualized attention in our overriding quest to conserve the lake and surrounding rainforest. 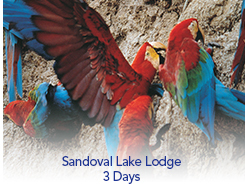 Sandoval Lake Lodge is built out of ecologically-correct driftwood mahogany and is owned jointly by a non-profit conservation group and five families of indigenous Brazil nut collectors. Transfer from Puerto Maldonado airport to the river port on the Madre de Dios River. A 25 minutes journey down the Madre de Dios River by motor canoe brings you to the end of the trail in to Sandoval Lake Lodge. From here the trail takes you on a 2-mile walk/or rickshaw ride through secondary forest, until we reach a small canal where we board canoes and are paddled 220 yards through a flooded forest of 100-foot tall Mauritia palms. As the canal opens onto the shimmering surface of the lake, we transfer to a catamaran and are leisurely paddled across half the lake to the lodge. After lunch, once again board the catamaran and set off to explore entire west end of the lake. Here, in the flooded palm forest, we drift to the sounds of hundreds of Red-Bellied Macaws as they return to the palm forest for the night. We return to the lodge around nightfall for dinner. After a dawn breakfast we take a final, shorter paddle around the west end of the lake to try and glimpse the Giant Otters before returning to Puerto Maldonado to catch the flight to Lima. (June 20 to 24, 2019) and during Christmas & New Years. • All excursions and meals.